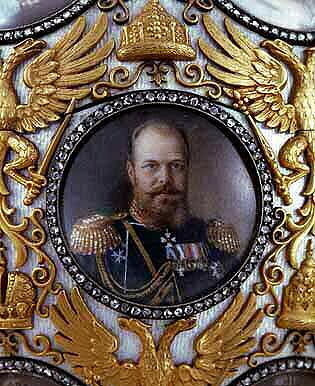 During the reign of Nicholas II, the 300th anniversary of the rule of the Romanov Dynasty was celebrated in 1913 with great ceremony and opulence. This Easter Egg commemorates this event. The decoration shows a rich use of elements of state symbolism. 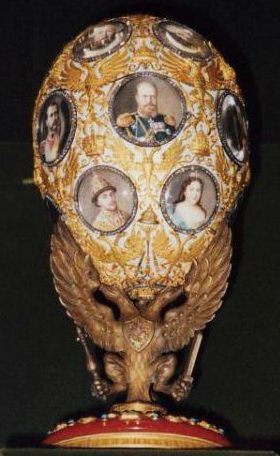 The gold egg, faced with white transparent enamel on a guilloche (1) ground, is decorated with applied stamped two-headed eagles, royal crowns and wreaths and eighteen miniature portraits (see) of the czars of the House of Romanov, from Michael Fyodorovich, to Catherine the Great, to Nicholas II. These are in round diamond frames, painted in watercolor on ivory by the artist Vassily I. Zuev. The white enameled shell of this egg is nearly obscured by over eleven hundred diamonds and golden symbols of royal order. A large diamond bearing the dates "1613" and "1913" is secured at the top of the egg, while a large triangular diamond fixed to the bottom end covers the monogram "A.F." 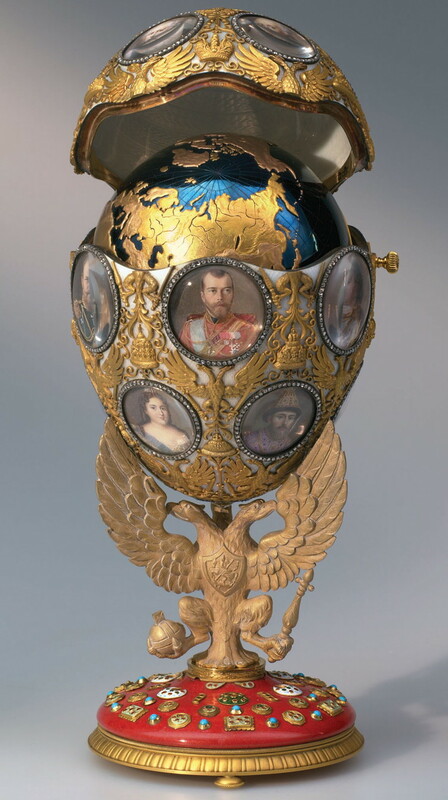 The egg rests upon a threefold heraldic eagle, symbolizing the power and glory of Russia and Romanoff's Dynasty, which in turn stands on a circular base of purple, imitating a state shield. The base is constructed of purpurine, decorated with small enamel patterns, and secured on three supports cast in the shape of flattened pellets. Nicholas II and Alexandra Fedorovna made a pilgrimage in the tercentenary year, retracing the journey made by Michael Romanov on his way to the throne. In fact, the celebrations across Russia were sustained, extravagant, and, judging by photographs, well attended by the masses. The events surrounding the final few years of Romanovs are documented in books about the ruling families and their reign. Traditionally, the egg held a surprise, which would become visible when the hinged lid was opened. Here, the interior of the lid is decorated with a delightful illustration in white opalescent enamel on a ground carved with guilloche ornament. A rotating globe is attached to the inside of the egg; it is made of burnished blue steel, imitating the sea. The land on the globe is executed in gold of several colors. The globe consists of two northern hemispheres. One half shows the territory of Russia at the end of 1613, the date of accession to the throne of the first Romanov Czar, Mikhail Feodorovich. The other shows the territory of the Russian Empire in 1913, under Nicholas II. The creative fantasy of the artists of the Fabergé firm was unparalleled. In this example, a significant historical theme has been given splendid artistic expression. One of the most important events in the history of the royal family and in Russian life at the beginning of the 20th century has been preserved in the form of a jeweled souvenir, yet the work's historical significance has not diminished its artistic expressiveness.